Looking to pick up a nice afikomen gift for the seder? Here are a few books they'll be sure to love. (JTA) Afikomen hunts, a rambunctious pup and the catchy classic "Dayenu." All are featured in a half-dozen new Passover books for children that will inform and entertain even the littlest kid - or a whole herd of 'em. The eight-day holiday kicks off this year on the evening of April 22. Why not pick up a new tome for the tyke in your life? Prices are about two zuzim and up. This colorful board book is the latest addition to a lively series that introduces young kids to the Jewish holidays. Here, the green buds of spring are the first hint that Passover is coming. Readers follow a family as it prepares for the holiday, from spring cleaning and using home-grown parsley for the seder plate to learning the Four Questions and anticipating the hunt for the afikomen. The joyful refrain — "Passover is coming! "— repeats at the end of each verse and is sure to build excitement as the date approaches. Hachai continues to create lively, interactive books appealing to haredi families. 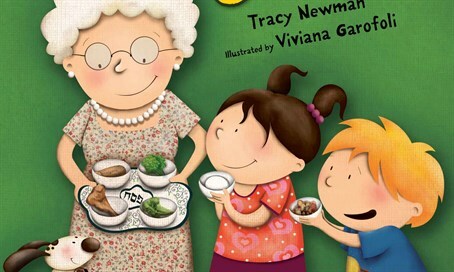 Young kids will enjoy the rhyming clues to “who am I” questions — “I'm a food that's baked in a hurry, but I still taste great, don't worry!”— in this lift-the-flap book about Passover. The whole mishpacha – mom, dad and the five kids – all lend a hand to sweep and clean the house. They watch as workers bake handmade matzah and make startled faces as they bite into the bitter herbs. The end page poses a series of holiday observance questions (the answer key is color- and number-coded) and there’s a glossary, too. A lively alphabet hunt is on in this large format, brightly illustrated book that introduces young kids to Passover themes, customs and foods. The clever clues, from A to Z, are thought-provoking and range from easier spot-the-answer picture puzzles to more challenging questions (“At last the Jews had found their home, how many long years did they roam?) that will keep kids engaged and entertained. Balsley keeps things interesting with a variety of activities, including puzzles, mazes, riddles and maps. There's an illustrated answer key at end, along with a brief explanation of the holiday. This lively book is a riff on the Passover favorite “Dayenu,” a song that echoes with the theme of gratitude. Readers follow a contemporary family as it readies to celebrate the holiday, including a trip to the farmer's market, where it doesn't take much to convince mom to adopt a kitten from a shelter. They chop apples for charoset, dress up for grandmother's seder and hunt for the afikomen. The word “dayenu” repeats throughout the story. The colorful, cartoon-like illustrations bring the story to life — many are full-page or double-spread. The happy ending includes a Passover sleepover. The book concludes with an author's note, glossary and the music to “Dayenu." This endearing story — the first Jewish picture book from the acclaimed author of “The Outlandish Adventures of Liberty Aimes” — opens on the first night of Passover as a young girl named Sarah is anxiously setting the table, making sure to include a place for Elijah. As the seder unfolds, a rainstorm and cold winds threaten Sarah's neighborhood, and there’s a power failure. The lights stay on in Sarah’s home, however, and one by one, the neighbors appear at the family's door and Sarah sets another place. First it's Mrs. Faiz, the florist, then Bagel Ben and Doughnut Dan. Kids will take notice when Music Man Miguel and his mischievous monkey Manny join the growing crowd. But when the young boy who sells magazines arrives, Sarah is worried that there is no longer a seat for Elijah. Kids will be surprised by the story's satisfying end. The large illustrations match the gentle tone of the story and capture the multicultural life of the neighborhood. Ruben told JTA she was inspired by the Haggadah passage “Let all who are hungry come and eat.” She wanted to evoke the sense of tolerance and welcoming strangers – a prominent theme of the seder.